The issue we are trying to tackle is the societal stigma faced by members of the LGBT community. As a group who has had our close friend come out to us as gay recently, as well as having one of our parents work at an alternative high school where many transgender youth attend, we would constantly hear stories of the various ways these individuals were bullied or discriminated against. We thought to ourselves: how can we possibly increase their chance of being accepted in society? To solve these critical root problems, we created Queery. 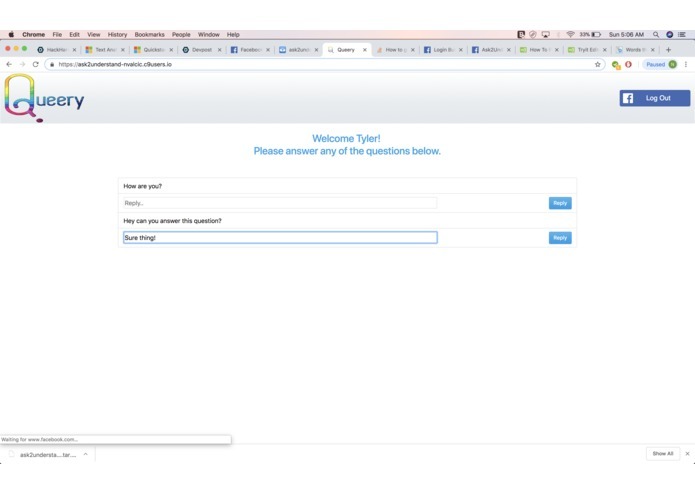 An AMA-styled forum where people can ask members of the LGBT community questions anonymously, while at the same time having every measure in place to minimize the risk of hateful comments reaching the respondent. Finally, to encourage community activity we added the ability to upvote and downvote comments. So if the comment does post and is hateful but was not caught by our previous security measures, other members can downvote it to the point where it becomes invisible to the LGBT respondent. Watch our demo video to see how it works! Introduction: In 2018, society has made incredible advancements in the acceptance and protection of vulnerable groups. Yet, despite the progressive outlook taken on by the majority of society, as humans, many of us fall victim to short-sightedness and judgement. A lack of understanding and education concerning those around us can often result in differences being interpreted negatively and discouraging inclusion. Thus, members of groups such as the LGBTQ+ community tend to become ostracized and mistreated by others, creating an ongoing societal stigma. Queery, a social platform, focuses on dissolving this inherent stigma pertaining to the LGBTQ+ community through a safe, welcoming environment where members have the ability to engage in positive dialogue, to exchange perspectives, to ask questions, and more. 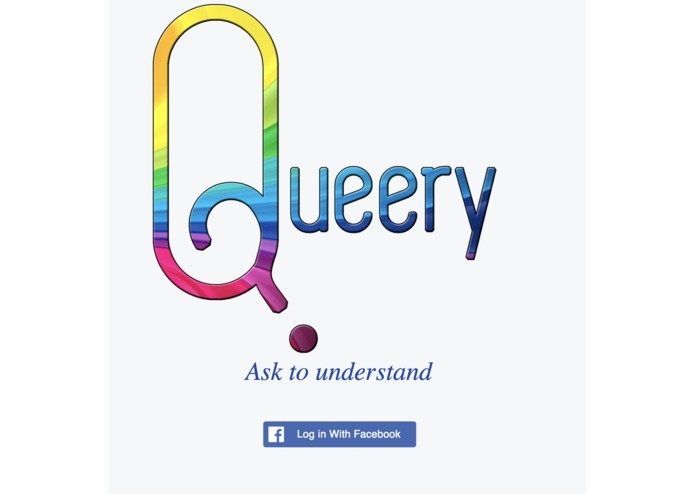 How we built it: Queery was built by incorporating both Microsoft text analysis and Facebook Graph APIs, creating a social and interactive platform for users. 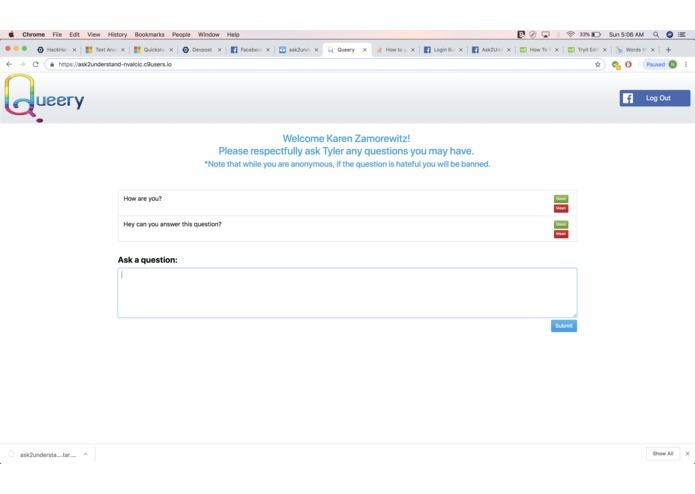 Challenges we ran into: In order to ensure Queery was an environment which was safe for its users, we employed a few methods of filtering undesirable and discriminatory comments. One of these methods was using text analysis API which could return the sentiment of posts. The ultimate goal was to employ this technology to filter out any users who have expressed offensive statements on their Facebook profiles as well as to scan potential Queery posts for anything that is deemed malicious, banning those from accessing discussions. 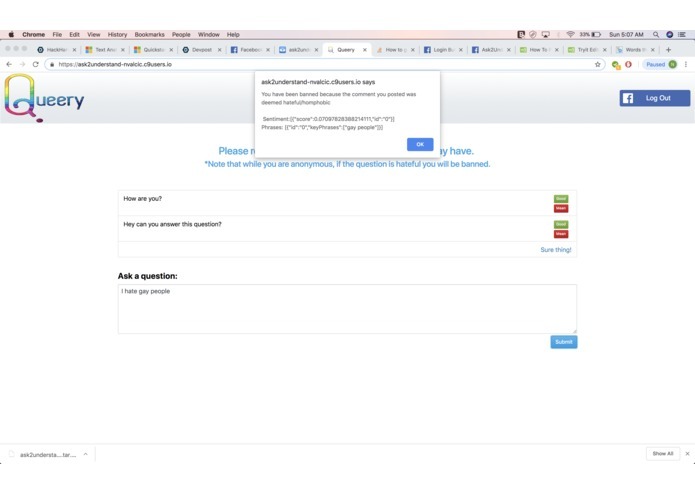 We experimented with several APIs, including that of Amazon, Microsoft, and Google. This meant building iterations, testing each option, and evaluating which API was the optimal technology for our purpose. Properly implementing and ultimately deciding on which API we would use was definitely a challenge as it required familiarizing ourselves with the varying documentation of each API. What's next for Queery: We hope to build upon our current safe space technology in order to protect users as much as possible while encouraging engagement between users. In future iterations of the platform, we believe an event section could further promote interaction and help to lessen the divide within society by building a connection that surpasses digital communication.